On January 31st, the deadline passed for countries to submit their pledged targets to be included in the Copenhagen Accord, the 3-page document that emerged from the Copenhagen climate talks in December and set up an architecture for countries to commit to their own chosen targets, and have them reviewed by an international body. The deadline has come and go, and 97 countries have chosen to associate themselves with the Accord; yet Bolivia, now one of the leaders of progressive governments on climate change, is quick to point out that while the countries involved may represent a large percentage of global emissions (80%), their actual commitments are simply not up to the task of getting us to 350ppm. Bolivia and it's ALBA allies, along with Tuvalu, Sudan, and a few other vulnerable nations, were the few countries who stood firm till the very end in Copenhagen when the unambitious Copenhagen Accord was being thrust upon delegates in the final hours. Without their courage and opposition to the weak document, the Accord would likely have been adopted, making it far easier for leaders like Barack Obama to call the summit a victory. Instead, world leaders had to admit that this agreement was not enough, and that we would have to keep working hard in 2010. And what's important is that the media reported this to the wider public - while this may not seem like much solace, it's key to continuing the momentum of our movement that the general public understand that we are not done yet. 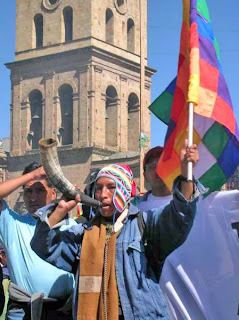 Bolivia is leading in another major way as well - in April they will convene a major summit of progressive government leaders, social movement leaders, activists, and civil society to map out points of concensus and a plan for shifting the international debate on climate change towards an outcome that is fair and ambitious. While Bolivia and it's ALBA allies are often marginalized by the mainstream media, I have to say that I have been very impressed with their openness and their collaborative approach towards organizing this summit that reaches far beyond the anti-capitalist, radical wing of the movement that you might expect. They have been working hard to reach out to a wide range of social movements and civil society, get invitations to government leaders with positions clearly different than their own, and map out an agenda that leads to open and honest conversations about a positive way forward. In a post-Copenhagen world, their commitment and drive to building a broader and more powerful movement in 2010 is one of the most hopeful and inspiring things I see to get involved with right now. For info on thePeople's World Conference on Climate Change, click here. Dear 350.org - Does this mean that 350 has / will now, officially endorse the position of Bolivia and the nessasary targets put forward by Bolivia & the most vulnerable states at Cop15? The G77 at Cop15 called for emission reduction targets of 52% by 2017, 65% by 2020, 80% by 2030 & well above 100 by 2050(by developed countries). Lumumba Di-Aping practically begged CAN & all NGOs to support these targets - yet - this has not happened. The Coral Triangle group has called for 52% by 2015. (developed countries. Bolivia calls for well below 1 degree climate change, well below 300 PPM and 49% domestic emissions cuts by 2017. Why is not even one large mainstream NGO bold enough to support what vulnerable countries need to survive? 350.org seems like the only large NGO who is ethical enough (& hopefully not compromised) - who could and should support these developing countries. I often wonder why the developing countries are leading the climate change movement - instead of the mainstream NGOs? Thus far the environmental movement is following behind - not leading. This is disappointing and I hope to see it change. Actions speak louder than words - please 350.org - put out a statement that you are now supporting the necessary targets the vulnerable countries have put forward. I am sure that the NGOs, including 350.0rg and CAN were fully aware of the emerging science presented at COP15. A representative of IPCC at a press Conference stated that st 2degrees the poor, the disenfranchised and the vulnerable would not survive, and at 1.5 there was a chance. Thus staying below 1 degree must be the Global goal. Also a representative of the World Meteorological Organization (WMO)was saying that the globe was heating faster, there were more severe climate related incidents, and than anticipated, and more drought were occurring than had been predicted in the 2007 IPCC Report that was based on 2004 and 2005 data. It is not only the developed states that have a climate debt to the developing world but also the citizens,in the developed states, who have benefited over the years from the overconsumptive model of development and from years of exploiting the South. The NGOs from the North must be working with the developing states from the South.